SILA is back with another video from 4/25/17...a lot of activity there yesterday. And another SILA video from yesterday 4/25/17. They've taken down the screen above one of the dams on ROA giving a view of the new ROA construction beyond. I think you are ever so slightly underestimating the popularity of the Marvel Cinematic Universe. I'm not saying that it's as popular as Star Wars, but it's a strong second place. In any case, there is NO WAY that Disney would release Star Wars Episode IX and Avengers Infinity Wars 2 at close to the same dates. They'll both be insanely successful, but putting them close together would definitely result in weaker opening day/weekend numbers for both. Probably the same number of the super-fans would show up for both opening days, but a lot of the slightly more casual fans would end up picking one to go to at/around the opening day and then wait at least a few days to go see the other one. Yeah I highly doubt Disney will keep Avengers in that slot. Remember in 2007 when POTC 3, Shrek 3, and Spider Man 3 came out within weeks of each other? All three of them underperformed. If if they keep the schedule as is, SW will destroy Avengers summer legs. 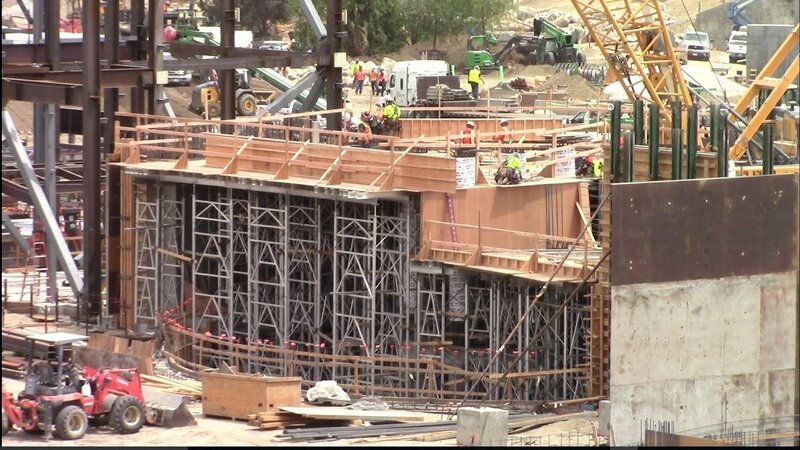 Yes, they look like form framing for openings in the poured concrete wall. That's a LOT of rebar so that wall will be very strong. The workers appear to be on the INSIDE of whatever building the wall they are working on. So those opening could be entering or exiting that building, possibly queue. 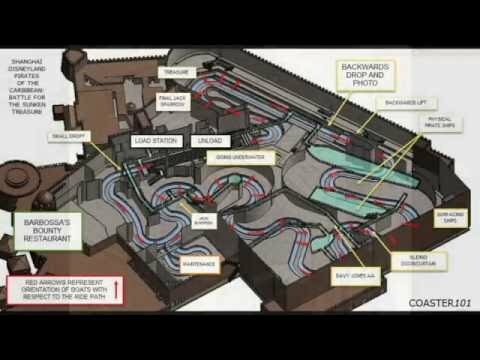 This video talks about the ride system. It's pretty cool actually. More SILA video from 4/25/17 with views from Critter Country...Jane is really keeping the videos coming, can't thank her enough. And one more from 4/25/17 with views around the Mark Twain and Big Thunder Mountain. 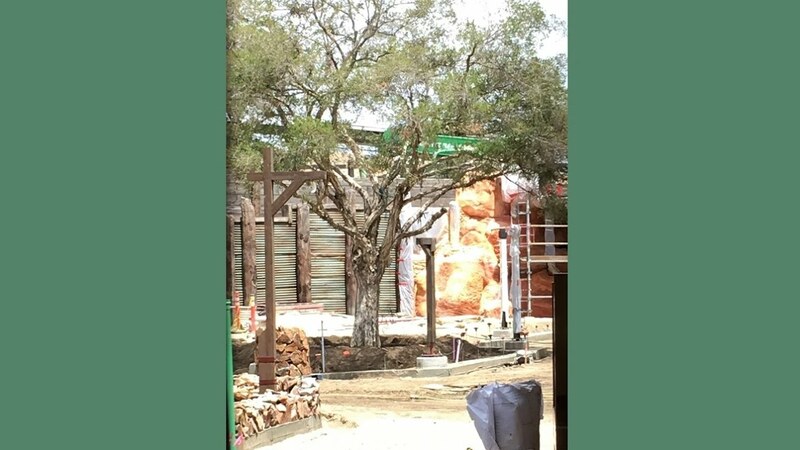 With as much of the BE show building is visible, even over the trees, the over all height of the rockwork we'll see from on/around the RoA is going to pretty grand. 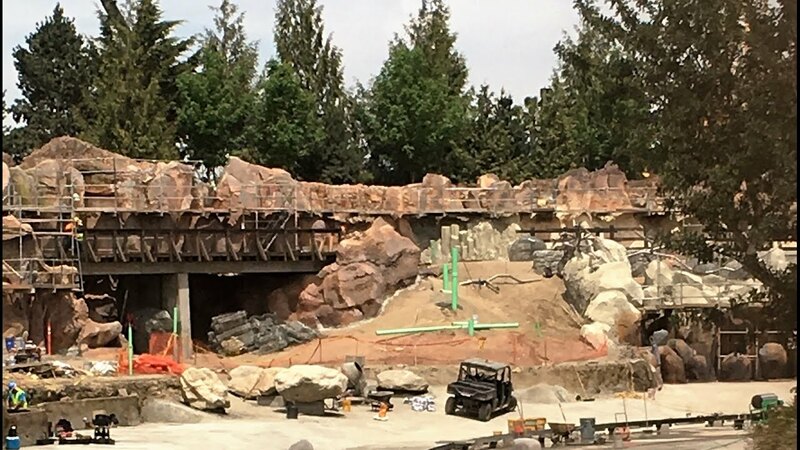 As it is, I think the amount and variety of rock work being added to the north side of the RoA easily rivals any other scenery in the DLR. The Cadillac Range, in Cars Land, is pretty impressive, but with the wider variety of natural and man-made structures and the water features, I think that the new scenery will top it. I agree, the diversity of the rock work around ROA is without a doubt the most complex at DLR so far. Especially when you figure in the rerouting and integration of the DLRR with all of the water features I think as you do, this will be a higher bar to be sure. Fresh Baked mentioned July 31 as the date the DLRR will return? I had heard from one of the engineers that they where told to have trains ready to roll by end of May. Has there been any more concrete release of when they are targeting to re-open ROA and DLRR? My best bet is still 4th of July weekend. They're going want to have that open for the heavy crowds, I'd imagine. Waiting until the end of the summer to reopen these massive people eaters would be a shame. Actually, Fourth of July weekend has been pretty mellow the last few years since most AP's are blocked out. The spikes in attendance occur when most AP's are about to be blocked out and immediately after they become unblocked. Early June and late August will be far busier than Fourth of July. Since the tracks for DLRR are still not installed, and there will be a considerable amount of time for testing and adjusting, I wouldn't expect DLRR to return before August at the soonest. The new route of the DLRR will take a lot of time for the engineers to get used to with the sharp curves and grade change. The Rivers of America and all the accompanying attractions should be open by Fourth of July for what it's worth. Fantsamic!! might need a little extra time, though. Are the sharp curves really that much sharper than say the original "corners" of the DLRR or the curves the train takes coming out of the roundhouse? Have turn radii been posted anywhere? Also, where does the grade change? It starts in CC at the previous grade and ends in TT at the previous grade. So the change is no different. Are people saying that there are steeper parts within the new track segments or that it goes downhill a bit then has a steeper grade to get back to TT grade? I don't see any sharp curves, either. The only thing approaching a tight curve is when the tracks come out from behind the Hungry Bear and makes that first right turn around the shore of the RoA. I'm also curious about where the increase in grade will be. Is there a slight arch where the tracks travel around the north shore of the river? I actually think that it would be cool if the trains traveled at a reduced pace, along that stretch of track, giving passengers more time to soak up the new, clearer view of the RoA and TSI, along with all of the rocks and waterfalls (as much as they can be seen from the passenger cars. One thing to keep in mind when comparing curves along the main line with the curves going into and out of the roundhouse: The trains aren't taken in and out of the roundhouse at anywhere near normal running speed, so navigating tighter turns there is likely easier. I wonder also though ( maybe not likely because the trains go so slow ) now that they turn left and in certain cars passengers face outward and or are on the right side for those sitting forwards, being that they do not have a restraint holding them in is it an issue? I am not seeing any banking so there is a tendency to be pull pulled outward depending on speed maybe they need to test this even though there data says its a none issue there could be safety regulations that requires a certain amount of test runs under certain conditions before opening up to a taking on guests. Also remember the cars are hooping non secured cargo ( people ) so there is a leverage issue that maybe requiring stringent testing. Thank you for asking this! It seems to me this whole "grade change" situation is something that someone said one time like 10 months ago, and got parroted around and now everyone thinks there is a grade change and it will require a lot of testing. I would love a specific example of what people mean by this! Otherwise, it seems to me it's gonna be the same grade as it always has been. Also - the satellite image version of Google Maps just updated and now shows Star Wars Land construction at Disneyland. Unfortunately, it's an old shot. Hmm,... its still showing the old image for me prior to construction?